First things first, the aspiring undead must, of course, return to life. I say “life,” but it is sufficient — indeed, preferable — to aim for a state of undeath, keeping your audience oblivious to the cruelty of suffering that permeates your motionless heart. Perhaps anticipating scepticism, Sibly invited his readers to experiment upon “a fowl, lamb, cat, dog, or any animal, by plunging them under water until they are apparently dead, or piercing them through the head, or any part of the body except the heart; by suffocation, or an electrical shock.” The unfortunate creature was then to be restored to health by the tincture. Proof indeed that such a medicine must be of service to the would-be vampire! Dr. Sibly's broadsides proclaimed that “The Blood is the Life,” and at the end of the 19th century, this biblical quotation was still inspiring patent medicine promoters and potential vampires alike. R. M. Renfield, the creature-consuming asylum inmate in Bram Stoker's Dracula, points out that the phrase has become “vulgarised” by its inclusion in nostrum advertisements. He appears to be referring to Clarke's Blood Mixture, a popular tonic originating in Lincoln, England, but becoming “world famed” for its enriching properties. Based on potassium bromide, it promised to “cleanse the vitiated blood” of all impurities — a useful product to keep on hand for those times when you’re not sure where your victim has been. For occasions when society makes it inconvenient to sup from the pulsating jugular of a living being, a practical substitute is available in the form of Capsuloids, a product that emerged in Brockville, Ontario, before finding its way to London in 1897. He drank fresh blood every day at the Butcher’s. His doctor had ordered him to do so. He was Pale, Anaemic, had Indigestion, Constipation, Bloating, Palpitation, and a cough, and was spitting up considerable, and he had lost over 21 lbs. He grew sick of the smell and taste of Fresh Blood and could not swallow it any longer. By the early 20th century, Capsuloids had undergone a renaissance as a hair restorer — good news for those of you following in the footsteps of Nosferatu! There's a problem with taking an anaemia remedy, however: You are in danger of losing the mysterious ashen complexion that so unnerves your victims. Humans might begin to compliment you on your healthy, rosy cheeks! 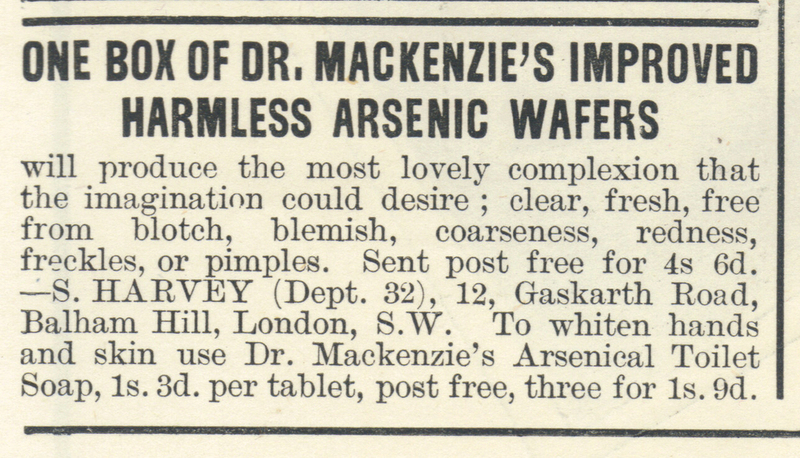 To combat such embarrassment, a course of Dr. MacKenzie's Improved Harmless Arsenic Wafers should set you right. Based on a well-established American product marketed by Dr. James P. Campbell, the wafers capitalised on arsenic's reputation as a beautifier (though it’s unlikely that they actually contained much of the poison). Arsenic was said to give an unusual metallic lustre to the eye and an ethereal pallor to the skin, plumping out wrinkles to create a semblance of eternal youth. But the trade-off for arsenic-eaters was a Faustian one: The illusion of youth and beauty carried the price of hastened death. And once begun, the habit could not be broken without watching one's complexion disintegrate to a state fit only for a return to the grave. Within the pages of Victorian newspaper, there are products aplenty claimed to enhance your deathly countenance and overcome your cravings for blood. But beware, aspiring vampires: The attractive advertisements could just be a means to bleed your pocketbook dry. Caroline Rance is a British writer whose website, The Quack Doctor, focuses on unusual patent medicines advertised in historical newspapers. The Quack Doctor: Historical Remedies for All Your Ills, her book about the stories behind Victorian and Edwardian remedies, was published in October 2013. She is also the author of a novel, Kill-Grief, set in an 18th century hospital. This coverage of the Victorian era is brought to you by Clementine Classics: Sister Carrie by Theodore Dreiser, the first installment in the Clementine Classics e-book series from Black Balloon Publishing.